We understand that choosing the right play set from a wide variety of options is not an easy task. Here are certain factors that you must consider before selecting any one for your community park. The first thing that you must consider is the material used. Manufacturers use metal, wood and plastic in constructing the play sets. No matter which play set you choose, ensure that it is made of commercial grade material. It should be strong, durable and can easily withstand harsh weather conditions. Next thing that you must look for is the quality of the play set. Ask the manufacturer, if he has the International Playground Equipment Manufacturers Association (IPEMA) certification. This states that the manufacturer is involved in distributing only superior quality play sets to the customers. Besides, ensure that manufacturer has constructed the play set in adherence with the guidelines defined by American Society for Testing and Materials (ASTM) and Consumer Product Safety Commission (CPSC). You should also consider the safety of kids while buying the play equipment. 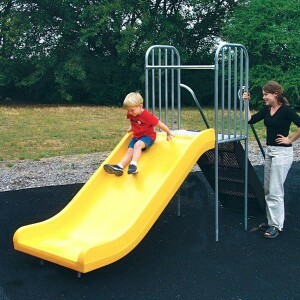 Whether you are selecting play ground slides or swing sets for your community park, ensure that the manufacturer has installed the essential anchors like bars, railings, hinges etc. at the required places in it. Also, make sure there should be no pointy edge or rough surface that can harm the kids. We hope that these factors would help you out in taking the right purchasing decision.